Mechanical stress on plastic piping systems is one of the leading causes of premature leaks. Typical pipe clamp products often create unintended fixed points throughout piping systems that permanently lock in stress. To address this challenge, GF Piping Systems (GF) has introduced a new pipe guide and valve support system specifically designed to eliminate stress transfer to plastic pipe caused by normal thermal expansion and contraction, improper installation, or seismic events. The new Stress Less® Pipe and Valve Support System from GF maximizes the service life of PP, PVDF, HDPE, PVC, CPVC, and ABS industrial piping systems by providing proper support. "The new system is designed specifically for plastic and offers tremendous benefits to anyone involved with designing, installing and owning thermoplastic piping systems," explains Alphonse Anderson, Engineered Piping Systems Product Manager for GF. "The pipe guides can be used for any manufacturer’s thermoplastic piping system in IPS (inch) or metric sizes, while the valve supports are specifically for GF valves,” he adds. Using the new guide system, the pipe only comes in contact with a low friction, molded HDPE insert that allows it to slide easily with minimal stress or wear during each thermal expansion cycle. The pipe never touches any metal bracket, which could potentially cause wear on the piping because of sharp edges. The pipe guide inserts are designed to have a 3mm gap around the OD of the pipe, which allows unrestricted movement of the pipe in the axial direction. It also lets engineers design for lower accelerations and forces caused by seismic or water hammer events. An outer steel hoop provides the necessary strength to support the weight of the piping in normal operating conditions– even during a strong earthquake. Additionally, the design does not allow tightening of the guide insert against the pipe at all – only the steel hoop can be tightened. This prevents imparting mechanical stress on the pipe during installation. 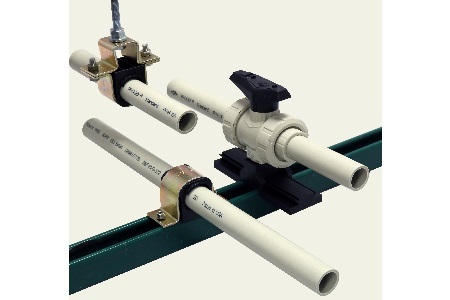 Offering complete installation flexibility, pipe guides can be mounted in a variety of positions including on flat surfaces, on strut channels, horizontally as a hanger, or vertically. Stress Less valve supports complete the system. Valves are able to move in two directions as the pipe expands and contracts. This is accomplished by means of an innovative valve support base and slide set made of low friction PP. Valves slide easily with virtually no resistance at a travel range of ±3 inches. Like the pipe guides, the valve support base can also be mounted on any flat surface or on standard strut channel. All GF valves Type 546, 523, 543 and 5-series diaphragm come with integrated mounting inserts that directly line up with the sliding portion of the valve support and the included fastening hardware, making installation simple. For more information on the new system click here. GF Piping Systems supplies a full range of plastic pipe, fittings, valves, actuators, fusion machines, secondary containment, custom products, and sensors and instrumentation for industrial process control. For more information, visit www.gfps.com.